We need a way to recharge the battery from “shore power.” That means mains outlets attached to the house. The easiest way is to run an extension cord through an open door, but that’s not very elegant, secure, or warm. Some people add a full-on 30 amp or 50 amp circuit with a special plug. That’s the same plug as RV parks use for hook-ups. If you install the special outlet on the side of your house, you can use it to charge the battery faster or run more equipment than if you use a regular 15 amp outlet. We didn’t want to do that, though. RV parks are not going to be part of our itinerary. Friends’ driveways might be though. They will most likely never have the special 30 amp outlet, but they’ll undoubtedly have a 15 amp one. Charging from 15 amps is slower than charging from 30 amps, but we’ll most likely have the time. For us, the common availability of the 15 amp outlets was more important than the faster charging time. 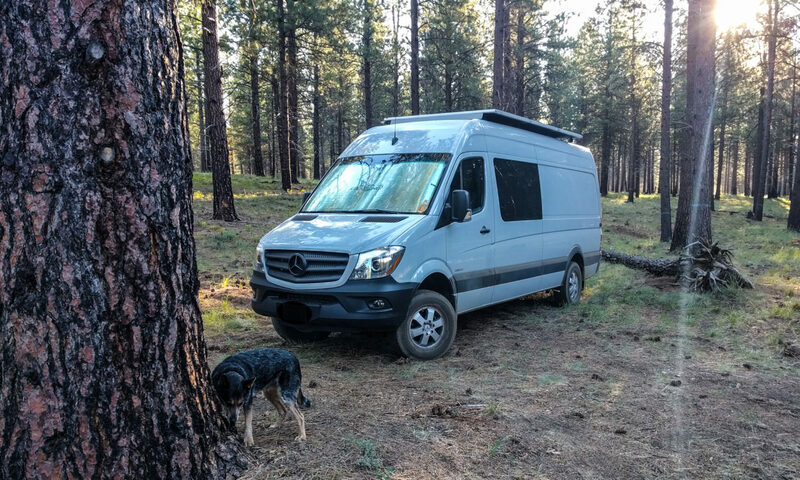 So, we just needed a way to run a suitable cable from outside the van to inside the van without compromising on security. The answer: drill a hole in the floor between the inside and outside walls of the van near the back door. 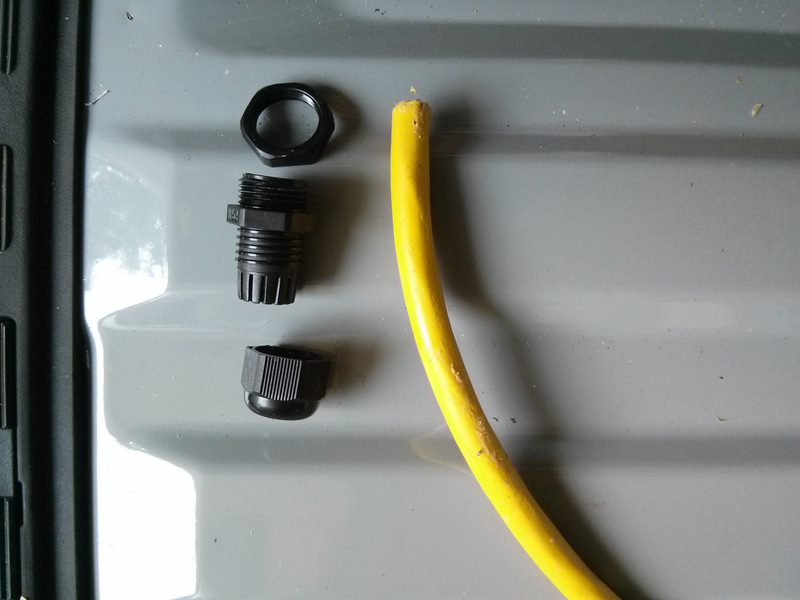 Then, run a 12 AWG extension cable from under the van, through the rocker panel, through the hole (first threading on the exterior parts of a waterproof grommet), and then into the switch panel where it gets its own special circuit breaker to be code-compliant. Mercedes makes some nice access holes in the rocker panel, so it was pretty easy to find a suitable location. I put a hinged cover on the hole. We used this one from Amazon and cut the enclosed back away from it. The cover has a little sliding flap at the bottom so it can either be completely closed up, or it can be closed except for a small hole that lets the cable through. The cable can be pulled out far enough to just avoid scraping on the ground. Then, it’s easy to add a second extension cable between this and a regular wall outlet. The inverter doubles as a charger. It can turn 12V DC from the battery into 120V AC, and it can also go the other way – turning 120V AC from the wall outlet into 12V DC for the battery to drink up. It’s even smarter than that, though. If we need to use power while the van’s plugged in, it’ll use the shore power first, but if that’s not enough it’ll add extra from the battery. It knows never to try and take more from the shore power than it should, so (in theory) it should never trip breakers inside the house. Hey! Nice job on the conversion. I just found that same access hole under the rear and wanted to run an extension cable similar to what you’re doing. Question: where did you source that hinged lid? Thanks! I used JR Products Electric Cable Hatch with Back. But I had to cut the back off (it’s just too big to fit through the hole). If you cut it off just right, it forms a nice flange. They also sell one without the back on it but I imagine you’d still have to do a little grinding to make it fit. Great idea – what kind of AC circuit breaker did you use? I found a Square-D 2 breaker box – but nothing smaller. The breaker is a 30 amp Main Blue Sea Systems 8077. The Blue Sea stuff isn’t cheap, but it’s designed for marine use rather than domestic use so it’s really tough and also more compact than the domestic units. We also used their 8 position 8059 panel as a branch panel. Again, a quality piece of kit. They also make an AC Main + 6 positions panel (#8027) if you don’t need so many branch breakers. any suggestions on where to find that waterproof grommet? They are called Cable Glands – the ones we used are these from Amazon. It’s a tight squeeze to drill the hole in the location we did and then get the cable gland in place. Thread the gland on to the cable before you try pulling it through the hole. since the shore plug is connecting to 15amp, was it necessary to upgrade the blue sea switch to 15amp or did you leave it as 30amp? Theoretically it should be a 15 Amp circuit breaker on the shore power input. However, we sized the wiring to take 30 Amps. The plug on the end of the wiring is rated to 20 Amps so that’s the weak link. Obviously any circuit we plug in to could/will be rated for less than 30 Amps but that circuit should be protected by its own fuse or breaker. Additionally, we can set the current that our inverter draws from the shore power. That means we can limit it to 15 Amps. Thank you for spending the time to educate us! I’ve been ordering our electrical components, spending plenty of cash. Michael, we run everything through the inverter because the inverter can smooth out any power fluctuation from the mains and it makes wiring the panel simpler. If you go straight to the panel with the shore connection, you need a switch to change between shore power and inverter power for the panel. If you go via the inverter, it just provides the panel with AC regardless of source, because it has a built-in transfer switch. I don’t know how much power your AC unit draws, but so long as it is inside the specifications for the inverter pass-through then there should be no problem attaching it via the inverter. In fact, the inverter will be able to supply a little bit of extra oomph from the batteries when the AC unit starts up. That could be really handy if you’re parked in an RV campsite with dodgy shore power. The only thing you have to consider in this situation is that it would be possible to accidentally run the AC unit from your batteries. That would be bad. However, the inverter would let you know pretty quickly I expect. I appreciate you Getting back to me. Where exactly did you drill the hole to run the 12G extension cord? I see the access hole under the van, but having a hard time visualizing where you drilled. The hole to run the extension cord is between the outer vertical wall of the van and the inner wall/support structure. Kind of inside the space where you’d stuff insulation material. The van’s rocker panel is directly below this area under the floor, so when you drill through this area you drill into the rocker panel cavity. That’s where the extension cord will be after you feed it through the circular holes in the rocker panel under the van. You could make life easier for yourself by just drilling up through the floor if you’re planning on putting a permanent cabinet in that area. Ahhhh – no wonder I couldn’t visualize it, I had stuffed insulation in there. I may just drill through the floor in main compartment since that will be my electrical area anyway with a cabinet. Thank you!